‘I think it’s quite unique to build a library in a city today,’ says Jan Vapaavuori, mayor of Helsinki. The city has just opened Oodi, a new central library designed by Finnish architecture firm ALA located opposite the Helsinki’s Parliament House on Finland’s 101th anniversary of independence. What makes Oodi even more unique, is that it’s also an ‘open user platform’ for sewing, gaming, 3D printing, playing music, soldering, cooking and socialising. The architectural competition for the library launched in 2012 with a record number of 546 entries – in Finland’s typically fair and democratic way, open calls for architectural competitions are also anonymous. It was an opportunity to design a national monument in the very centre of the city neighbouring Parliament House, Alvar Aalto’s Finlandia Hall, the Kiasma designed by Steven Holl and the Helsinki Music Centre. ALA, with their first major cultural building, a theatre and concert hall in Kristiansand, Norway, just under their belt, entered. Antti Nousjoki, partner at ALA, who had previously worked for five years on OMA’s Seattle Public Library, brought his international experience and local knowledge of the Finnish library system to the project – ‘Growing up in a small town, the library is like an extension of your home,’ he says. The design process started with an analysis of function, which was a lot more varied than you might expect. As well as a library, the architecture has to express the public role of a national monument, and provide space for the activities destined for it from music studios to gaming rooms, a kitchen and workshops – all accessible with a library card. The architects landed on a plan for three levels; an open ground floor; a floating box; and a space on top of the box. This followed the need for a welcoming, social space worthy of its location, a black box maker space with a matrix of rooms for multimedia activities and also, the traditional library with bookcases. The team then worked with structural engineers to achieve a solution that would leave as much open column free space where it was needed. A 100m arched bridge of steel is the basis for the design. The two open-plan levels sit above and beneath the bridge, while the makers space occupies the bridge itself, and a double spiral staircase connects all three together. ‘The overall shape is not primarily structural, it’s functional and sociological. Its a manipulated diagram of these three conditions,’ says Nousjoki. Filled with light and rows of Libreria CF bookcases in white-painted aluminium designed by Dante Bonuccelli and manufactured by UniFor, the upper library space is the crowning jewel of the building. Like an undulating halo, the vast roof’s soft curves feature scoops of circular skylights. Nousjoki describes how in certain lights the corners of the ceiling blend with the fritted glazing that wraps around the level to create a continuous cloud-like effect. 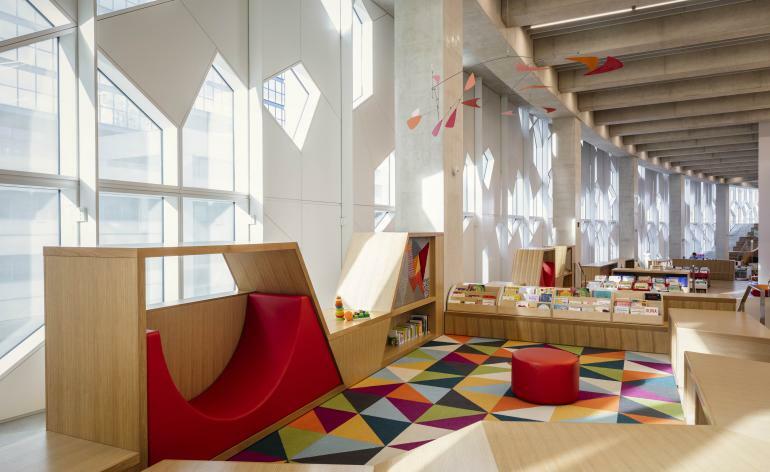 As well as a source of daylight, the skylights add warm artificial light, important during the winter months, when the library will be a beacon for the city in the dark mornings and afternoons. The ‘sunlit, cathedral-like library’ brings a nostalgic sense of pride and praise for the age of the book – ‘this message will become more pronounced as technology advances, or the space will become like the social open programme of the ground floor or specific niche space of the middle floor,’ says Nousjoki. The biggest worry of Katri Vänttinen, director of the library, is that libraries will become like museums in the future. She sees vast changes in how people use the library every year – lending of the music collection is decreasing by 15 per cent every year, thanks to music giants Spotify and Youtube. Yet, Finnish libraries continue to receive visitors, responding with new resources such as the maker’s space on the first floor. It’s a space filled with tools, aimed at teens, young people and professionals, where you could spend days investigating the recording studios, kitchen, workshops and gaming studios: ‘You can do anything here, it just takes imagination,’ says Tommi Laitio, executive director of culture and leisure at City of Helsinki. Architecturally incredible libraries are part of the fabric of Helsinki, from the impressive National Library designed by Carl Ludvig Engels in 1844 with its neoclassical rotunda extension designed by Gustaf Nyström, to Alvar Aalto’s university library framed by hanging lamps and campus views, or the uplifting Kaisa library designed by AOA in 2012 with its teardrop shaped central staircase. And far from just beautiful, they are all most importantly filled with people. The purpose of Oodi in its central location has a strong symbolic value for the city. ‘Sharing is becoming mainstream’ says Vapaavuori, and the library welcomes activities to take place in the urban space instead of in the private home.